Today is Palm Sunday, the beginning of Holy Week, when we remember Jesus’ suffering and passion, in anticipation of the great victory of Easter. This date, March 24th, also is the 33rd anniversary of the martyrdom of Archbishop Oscar Romero of El Salvador, who was murdered by a military gunman while saying Mass at a hospital chapel. Archbishop Romero had been an outspoken supporter of human rights in El Salvador, during a time of great repression and unrest that became a terribly bloody civil war. 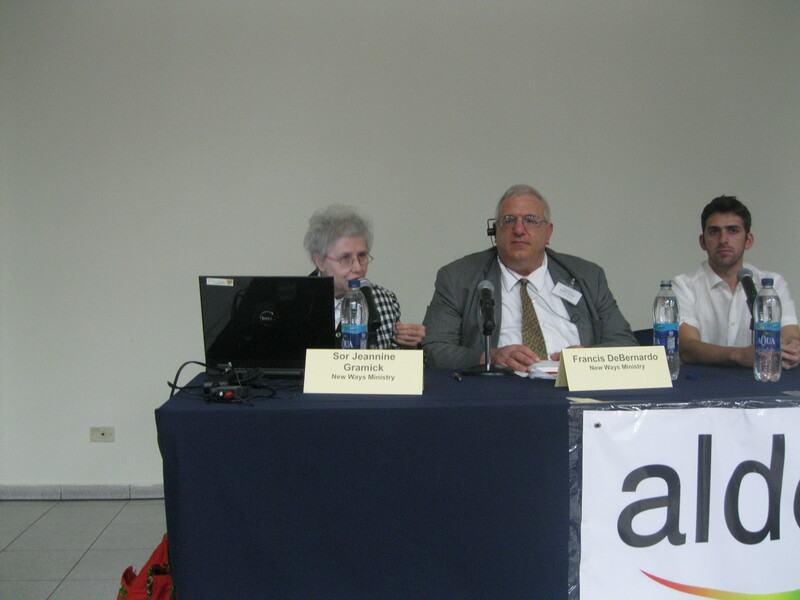 Sister Jeannine Gramick and Francis DeBernardo of New Ways Ministry make presentations at the first conference on LGBT human rights in El Salvador. Peace exists now in El Salvador, but that nation is once again involved in a great human rights struggle, this time concerning LGBT issues. A week and a half ago, I had the great privilege to travel to El Salvador with New Ways Ministry’s Co-Founder, Sister Jeannine Gramick, where both of us participated in that country’s first national conference on LGBT human rights. We made presentations there on the topic of “Religious Communities as Promoters of Human Rights,” speaking about how the Catholic Church’s human rights and social justice traditions compel Catholics to work to make sure that equality and justice exist for LGBT people. It was a great honor to participate in this program, and to witness the courage and fortitude of LGBT people and allies who are daily faced with threats of violence if they dare to live openly and honestly about their identities. The conference, entitled “Happiness and Sexual Diversity as Human Rights,” was sponsored by ALDES, an organization which works for human rights for LGBT Salvadorans both from inside that country and from the United States. Speakers on the program came from both countries, representing legal, political, religious, and human rights backgrounds. 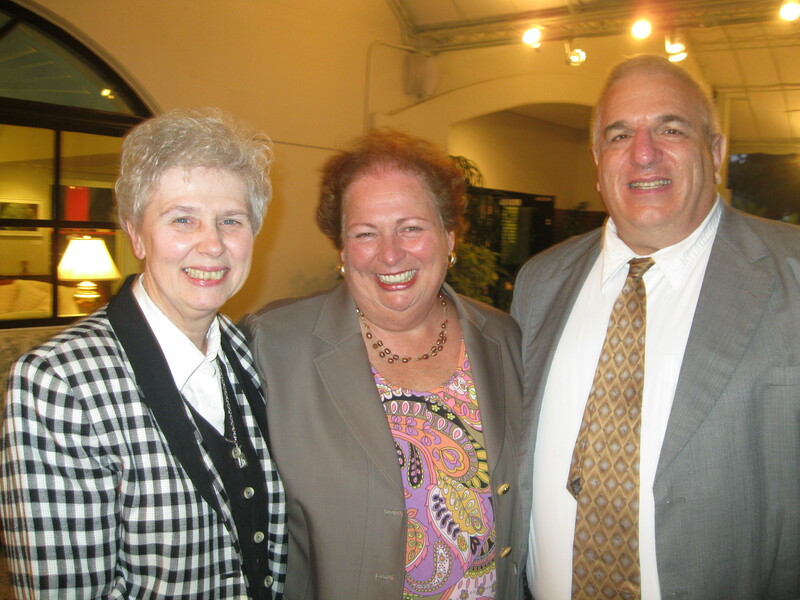 Ambassador Mari Carmen Aponte (center) with Sister Jeannine Gramick and Francis DeBernardo. Bondings 2.0 will provide further coverage of this important event, but it seemed appropriate to mark it on this day which commemorates the value of redemptive suffering. The civil war is over in El Salvador, but a new struggle for human rights and questions of sexual and gender identity have now taken center stage. May the witness of Archbishop Oscar Romero, and all the Salvadoran martyrs, guide this new struggle peacefully. May people of faith in El Salvador be as courageous and passionate in speaking up for LGBT equality as Archbishop Romero was in speaking up for the human rights of all people. Laity & Church Workers Compel Bishop to Retract Orthodoxy Test What’s the Real Problem When Clerics Are Revealed to Be Gay?